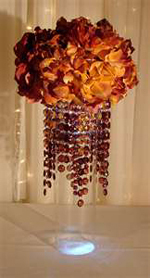 Make Your Fall Wedding Centerpieces Amazing! Fall Wedding centerpieces can be exceptionally beautiful using decorative elements found in nature. This is a gorgeous season to draw inspiration for your fall theme wedding. What type of centerpiece do you want? If you have thought about your centerpieces, hopefully you have thought about things like the height, overall size, and the types of materials, i.e. flowers, branches, or glass, you'd like to use. Keep the design for your fall wedding centerpieces clean and simple. You can achieve the beauty and glamour you are looking for without dropping tons of cash. Tweaking just a few things from an elaborate design can mean a dramatic difference in cost. For instance using carnations instead of roses, or using a slightly smaller vase will often cut the cost in half. Using natural materials can also add beauty and value to your designs, and fall provides some of the best materials to achieve this. If you crave a tall dramatic centerpiece achieve this effect by using tall willow branches instead of a tall vase or candle holder. You will get the height for mere pennies compared to the cost of renting or buying expensive containers. If volume is what you want, achieve the look with broad wide leaves, or big bushy fillers like lemongrass leaves or Gypsum (baby's breath). For fall centerpieces use dried leaves, in an array of autumnal shades. Add other elements to glamorize your centerpieces, starting from a simple design and using neat little details to enhance a solid design. Some really inexpensive ways to add that little zing is to use floral spray paint to provide a pop of color, and you can go as bold as you like, it's available in a complete rainbow. If you're a novice try just spraying your filler pieces like branches or sprigs of dry berries. Wide, broad leaves make a great canvas, and tall sprigs of eucalyptus are a popular choice. Even something as simple as placing your centerpieces atop a mirror can improve the look a great deal. For your Fall wedding centerpieces try natural elements like pumpkins or gourds which are readily available during the fall season. There are many fabulous ways to use them, try them as containers for your wedding flowers, or as a gorgeous accent on receiving tables. White or "ghost pumpkins" make an especially chic base for your fall theme centerpieces, and are easier to find than ever. Don't be afraid to dress up these simple gourds, they can add suprising elegance to your fall wedding centerpieces. 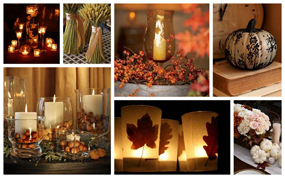 Get more fun ideas for Fall wedding Centerpieces and tips for decorating your fall theme wedding. Copyright © 2012 wedding-theme-ideas.com. All rights reserved.